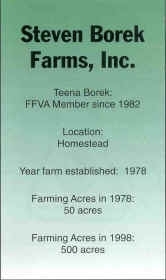 Teena Borek, owner and operator of Borek Farms, Inc., has established her family squarely in the Redlands of Homestead, Florida. Teena operates a 450-acre farm, growing beans, corn, squash and tomatoes on most of her land. But Teena has devoted 10 acres to a specialty item what she calls "Teena's Pride", tiny, miniature vegetables that are sold to chefs in upscale restaurants and clubs. 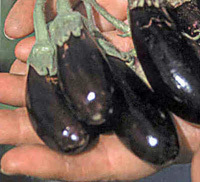 They include several varieties of tomatoes, peppers, eggplants, squash and green beans. I can't afford to eat in the restaurants that serve my vegetables," she joked. Because of high packing and production costs, these items are somewhat costly. But once you have tasted these unique vegetables, you understand immediately why they are so appealing. The delicate flavor and appetizing appearance of these varieties is so amazing. Originally from Newfoundland, Canada, this widowed single mother of two sons has overcome many hardships and obstacles commonly associated with farming. She is recognized as one of the state's most promising agricultural and natural resource leaders. Among many other accomplishments, she has served on the Florida Leadership program for Agriculture and Natural Resources, sponsored by the University of Florida. Teena is quick to credit others for her success, and is grateful for many in the community who have supported her. "I've survived in farming because I've had many good people help me." she said. Teena Borek is a charter member of the "Fresh from Florida" campaign and very proud of it. The logo is seen everywhere you look at her farm. All her packages and cartons bear the "Fresh from Florida" logo. She supports country of origin marketing for all produce sold in supermarkets to encourage consumer's loyalty to Florida products. She sells her produce to wholesalers and retailers, including Rite Pak and Harry's market in Atlanta, and ships miniature vegetables all over North America from California to Canada. The vegetables are in high demand in Metropolitan Miami, and local chefs visit her farm on a regular basis. The day I visited Teena was warm and bright. We started out eating fresh,uncooked corn that had just been harvested from one of her fields. I was somewhat timid about eating raw corn, but I daringly bit into an ear and was amazed at how sweet and tender it was. "The sugar you're tasting hasn't had a chance to turn into starch," Teena said. I spent the next two hours walking her fields, munching occasionally from the growing plants. Teena is also experimenting with fruits and vegetables not generally grown this far south. Her brussels sprouts were not maturing properly, but she found that the leaves make excellent salad greens. Her many herbs and spices including catnip and parsley, were both fragrant and delicious. "Someone has to get the word out that the current perception of farmers is wrong, and that we are the first environmentalists. Farmers make a living from the soil and have to make sure the water and soil are clean. Farms help the environment," she said. Teena is very careful about pesticide usage. Her vegetables, she assured me, were safe to eat right out of the field, and proved it by regularly eating a sample before giving one to me. Providing a quality product is not always enough to be successful in modern agribusiness. And more needs to be done to help Borek farms and other similar producers. For instance, fields growing beautiful, large, ripe tomatoes and green beans are not always being marketed because labor and production costs for harvesting are higher than their marketing price will bear. Many Florida farms can benefit from the Florida Agricultural Promotional Campaign. Under the "Fresh from Florida" umbrella, Florida agribusiness works together to promote and protect the diverse range of agricultural products in our state. Teena Borek came to South Dade as a Canadian teenager during the late 60's and 70's. The young Newfoundlander spent vacations visiting relatives. It was during one of those visits that Teena met, and later married, Steven Borek, a member of a local farming family. Together Teena and Steven started Borek Farms Inc., while also starting a family. Tragedy struck, however, a few years later and Steven's life was taken in an automobile accident, leaving Teena with a farm and two toddler sons. Suddenly Teena was thrust into a field of which she had minimal knowledge, but a great deal of determination. Determination, along with hard work are attributes that Borek drew upon to build Steven Borek Farms into a successful enterprise- an enterprise Borek hopes can be passed along to her two sons, Steven, 20 and Michael, 19. Borek does not hesitate, however to credit others around her who have contributed to the success of the farm. "I've survived because I've had people helping me, like my farm manager Julian Dahl" said Borek. "He makes the farm go-round." Dahl's special interest in farm technology has led Borek Farms to pioneer innovative projects. One such was "techno-tryout" on the farm was the mobile linear irrigator. This self-propelled irrigation system, which is now a mainstay on farms in the area, was seen for the first time at Borek Farms in 1998. Borek, who wears many hats now, including the "search and destroy" marketing kind, sees opportunity available for Florida growers daring to be different. 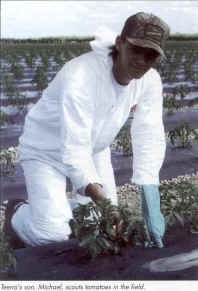 Teena, herself, specializes in growing exotic "baby" vegetable. Baby tomatoes, baby green beans, and baby squash are big-time crops Teena is supplying to a growing market. The miniature vegetables grown at Borek Farms are gaining trend-setting notoriety all over the country and throughout Canada. The success of Borek's miniature commodities venture brings new meaning to the expression "less is more". "Teena's Pride" may sound like an affectionate reference to her two sons, Steven and Michael, but it's also the label she puts on the quality produce she ships from her farm. Teena's proud of the possibility that her sons may continue the farm. Said Teena, "My children love to farm and want to continue to farm, but government beaurocracy hinders the perpetuation of the American family farm." Borek said that if she had a direct dialogue with American consumers, she could convince them all to show support for the national produce labeling act. "I feel American consumers are intelligent people and should have the ability to make educated choices about whether to buy foreign or domestic," said Borek. "I really believe that empowering the consumer is what will save the family farm in America. People are increasingly concerned about what they eat. If the American consumer is given information about how and where his food is grown, he will make a decision to save the small grower by purchasing domestically grown produce." A member of the current class of the Florida Leadership Program for Natural Resources, Borek is very enthusiastic about the curriculum. "The program teaches people in agriculture how to network and pull together- that's what's going to help Florida growers," she said "Sometimes when you're down in the trenches, you have a tendency to forget the world around you. As you listen to different speakers throughout the program, you begin to know and understand state, national and worldwide issues that affect all people, not just farmers. I feel the program better equips us to help our own businesses, the agricultural industry and our local communities. It's a really small world out there and we all need to work together to make it a better one for everyone." In addition to the Leadership Program and FFVA, Borek is a member of the AgriCouncil and has served on its board. She is also a member of Dade County Farm Bureau where she currently serves on the board. Wholesale prices have plummeted well below what it costs U.S. farmers to grow them. 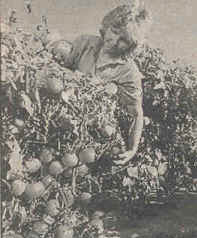 Teena Borek inspects her crop of ripe tomatoes. She doubts her farm can survive the flood of Mexican produce streaming across the US border. This surge of cheaper prices has reduced wholesale prices to 8 cents a pound, well below Borek's cost of 32 cents a pound. She would lose money if she hired workers to pick the crop. On Saturday, Borek plans to invite the public to pick her crop for 8 cents a pound. She hopes the price will shock consumers into thinking about the plight of South Dade farmers. Borek says she thinks the crisis will cause many farmers to quit. Teena Borek didn't know a lick about farming when her husband died 16 years ago leaving her with two toddlers and a mountain of debts. She had no choice but to work hard to save his farm for her family's future. It wasn't easy. Over the years, the hardy Newfoundland native survived two killer freezes. She bounced back after Hurricane Andrew wiped out Dade County's $1 billion agriculture industry, including the lime grove she had just bought. She didn't give up two years later when a rare November storm deluged freshly planted crops. But today, Borek, 41, doubts she can survive the flood of Mexican imports streaming across the U.S. border every day. This surge of cheaper imports has sent wholesale prices of tomato, squash, and other vegetable plummeting, often below what it costs Florida farmers to grow them. Unable to turn a profit, many South Dade farmers who raise almost half the winter vegetables grown in the United States are leaving acres and acres of tomatoes to rot. To her dismay, 40 of those acres are Borek's. Another 40 belong to her nephew, Jason, a young farmer who was encouraged by, amidst other things, a $160, 000 government loan to plant tomatoes. "I have never, ever had to leave a crop in the field," Borek said, her blue eyes weary, her blue jeans covered with dirt. "Never. What natural disaster can't do to us, our own government is doing to us. I know international trade is her to stay. You can't fight it, but your own government shouldn't help another country beat you down." * Bankers, saddled with unpaid loans, predict as many as 35 percent of vegetable farmers could be out of business by year's end. * Grading machines in packing houses sit idle. * Migrant farmers accustomed to working seven days a week are lucky to work one. * Owners of paint stores, lumber yards and restaurants see their own fortunes declining as their customers struggle to survive. "I have businesses that aren't sure they can keep their doors open another year," said Kim Sovia, president of the Greater Homestead/Florida City Chamber of Commerce. "Furniture stores, antiques stores, little restaurants. They all depend upon agriculture, and I foresee agriculture slowly dying. Our government is putting the industry out of business." Feelings of betrayal over the 1993 North American Free Trade Agreement run as deeply as the despair. Most industry analysts, however, say the dramatic 70 percent de-valuation of the Mexican peso is the primary reason for the surges in Mexican produce. The lower the peso, the less expensive Mexican products are, the more Mexico wants to sell to the US- for dollars. But farmers here lay the blame for the bleak times squarely on President Clinton, who they say has not fulfilled the promises he made when securing support for NAFTA. The trade pact phases out tariffs and lowers trade barriers among Canada, Mexico and the United States. Initially a hard sell in Florida, NAFTA won support of Florida's congressional delegation only after members secured a written pledge from Clinton to protect the U.S. vegetable industry. In a Nov. 16, 1993 letter to former U.S. Rep. Tom Lewis R- North Palm Beach, Clinton said NAFTA and U.S. trade laws contained the necessary measures to monitor prices and control export surges from Mexico. If Mexico exceeded its quota on vegetable shipments, Clinton assured, NAFTA would impose higher tariffs. If cheaper- to-produce Mexican imports were imperiling the U.S. vegetable industry, Clinton said, he would intervene to protect the domestic industry until it could adjust. Trouble is, spokesman for U.S. Sen. Bob Graham and the agriculture industry say, trade laws lack the power to protect seasonal industries from foreign imports. On top of that, the procedures to impose higher protective tariffs in a timely manner are not in place. In 1995, for example, Mexican imports exceeded their quota long before U.S. Customs Service imposed the higher tariffs- making the tariffs meaningless. Reacting to what he considers a do-or-die emergency for Florida's farmers, Graham met with agriculture and trade representatives and introduced corrective legislation. He reported some progress Friday. Effective immediately, Graham said the Customs Service will change its procedures to collect tariffs promptly. Calling the action a "modest step in the right direction," Graham said Florida farmers are still in need of urgent relief. "I have looked people in the eye who face bankruptcy in 30 days," he wrote. "I've heard their voices crack with emotion as they talk about laying off employees and letting crops rot in the field." Graham faces a tougher challenge on legislation that would make it easier for seasonal industries- such as vegetable farming- to petition for the president for relief from increased imports. Backed by the Clinton administration and U.S. Trade Representative Mickey Kantor, the bill unanimously passed the Senate on Jan. 26. But the House tabled it last week when leaders decided there was no immediate need to consider it. When she read that, Borek felt as if she had been kicked in the teeth. Facing a $30, 000 payment on her tractors and earning cents for a pound of tomatoes that cost her 32 cents to grow, she thinks farmers who perennially threaten to quit will have no choice but to follow through. Homestead bankers share her pessimism. Bob Epling, president of Community Bank in Homestead, predicted that if the tomato market doesn't turn around soon- very soon- 35 percent of South Dade's vegetable farmers will be forced to liquidate their assets. With mounting debts, losses and everything they own used as collateral, farmers are not able to get loans for next season. Epling should know. He attributes 35 percent, or roughly $45 million worth, of the outstanding loans at his bank to agriculture. Each acre of tomatoes, for example, represents a $5,000 investment for the farmers. Dade Farmers are not the only ones in distress. Bob Blankenship, a spokesman for the state Department of Agriculture, said Mexican imports are squeezing farmers statewide. But with their shorter season and head-to-head competition with Mexico, Dade Farmers are just being squeezed faster and faster. "Other parts of the state are not as heads-up against Mexico," Blankenship said "Part of the season they can make a buck and afford to lose a buck. Dade County does not have that luxury." Frustrated, Borek is grabbing at straws. For now, she is planning a direct appeal to consumers who, she says, are not reaping the reward of free trade at the supermarket. Retail tomato prices haven't plummeted as wholesale prices have. On Saturday, she hopes to invite people to pick her tomatoes for 8 cents a pound, the same price her crop gets on the market. She hopes the ridiculous price will shock consumers into thinking about South Dade farmers who have been growing much of the beans, squash, eggplant and bell peppers they eat every winter. With an expected cold front approaching, she also held out hope they'll remember their history. "What happened in the freeze of 1989 is a fact: the minute we froze, Mexican tomatoes went sky high," Borek said "If Mexico pushes U.S. farmers out of business, there will be a permanent freeze. Nobody will be able to afford tomatoes."